What is canyoning and why Madeira? Canyoning on Madeira is all about exploring canyons using a variety of techniques: walking, crawling, sliding, climbing, jumping, abseiling, and swimming. The island has built up a reputation as a prime destination for canyoning in Europe. An abundance of rivers and canyons, allows for exercising this activity at all levels. In addition canyons can be accessed easily from the southern or the northern parts of the island. The natural settings are beautiful, temperatures are ideal, and the guides are well trained professionals. On Madeira, no need to engage in extensive wilderness travel to reach its beautiful canyons. a 10-15 minute walk from the roadside generally suffices. The canyon trail on Madeira can get a little busy at times during high season, so ask about this before you book. 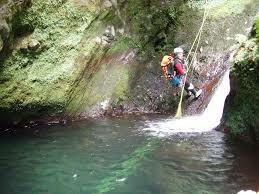 Canyoning is a great activity for individuals, couples, or families. Multiple companies on Madeira offer packages for beginners, intermediates, or advanced canyoneers. No need to be an athlete to book a beginners tour, if you are in halfway decent physical shape, go for it. Easy! Contact one of the companies below and book a tour. Their offers are generally similar and you can ask them about the specific canyons they use. A tour will include hotel pick-up, all of the equipment you need (boots, neoprene suit, helmet, safety gear,…), so all you need is a bathing suit or underwear. For my most recent tour with EPIC Madeira, I departed from a North Coast location and went to the rendez-vous point by car, therefore I got a discount off the regular tour price.